Home / Aunt Lyn's Doggie Wellness Update / Why Do Dogs Eat Grass ? Why Do Dogs Eat Grass ? While there is no consensus view on why dogs graze on grass, various theories are debated, and to make it more confusing many contradict each other. 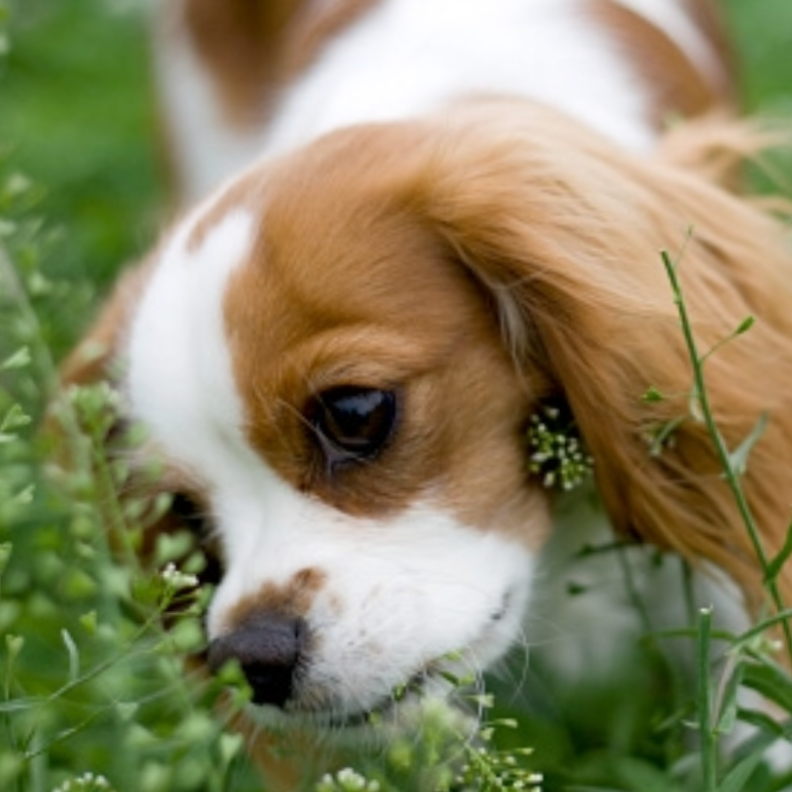 Some hypothesize that dogs eat greenery because they have an upset stomach - however, doing so causes them to vomit. On the opposite side of the spectrum, it is theorized that dogs eat it because they want to vomit. Searching for why eating grass elicits a vomiting reaction in dogs leads to millions of websites which generally agree with one of the two juxtaposing ideas (Corren 2014). The prevailing view at Aunt Lyn’s disagrees with the previously listed approaches. The theories do not take into consideration a dog’s evolutionary history, and how the environment has changed so rapidly around them. In today’s predominantly suburban society, the herbs that make up so many essential oils are scarce and rarely found in gardens and parks that now make up so much of a dog’s interaction with its habitat. In the past, eating the surrounding greenery would lead to a dog fulfilling its nutritional requirements, whereas in the modern era it leads to an upset stomach and vomiting. That’s why at Aunt Lyn’s, it is our mission to provide dogs owners with information on supplementing their dog's diet with fresh herbs, like oregano, basil, rosemary and how about parsley for fresh breath! In addition, using essential oils in diffusers -can aid not only your dog but you. Remember the usage of aromatherapy has been shown to be a practical alternative treatment (Wells 2006). Nutrition is a key part of your dog’s physical and emotional wellbeing. So start sprinkling a few fresh herbs and even a few spices ! Remember the usage of aromatherapy has been shown to be a practical alternative treatment (Wells 2006). Corren, Stanley. “Why Dogs Eat Grass - a Myth Debunked.” Psychology Today. Sussex Publishers, 18 Dec. 2014. Web. Wells, D.L. 2006. Aromatherapy for travel-induced excitement in dogs, JAVMA 229(6): 964-67. Aunt Lyn has been in dog care service for over two decades. In this time, she has trained hundreds of canines of all varieties, with there being hardly a breed that she has not had hands on experience with. This includes helping not only the dog’s physical health, but also their emotional well-being. Her dedication to this cause has led her to create her own line of essential oils for canines. This blog shares much of the useful information that Aunt Lyn has gathered through her years of experience, from her nutritional expertise, to animal safety tips, and innovative B.E.S.T (Behaviour, Exercise, Socialization, Training) approach.